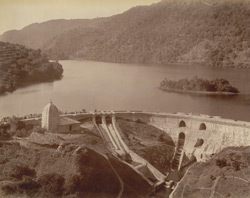 Photograph of Bhimtal from the Macnabb Collection (Col James Henry Erskine Reid): Album of views of 'Naini Tal' taken by an unknown photographer. This is a view of the lake with the dam in the foreground. Bhim Tal (Bhim Lake) is near the hill-station of Nainital in the Kumaon Hills. This area of Kumaon came under British rule after the Anglo-Nepal War (1814-16) and Nainital became the summer capital of the colonial administration of the province. The Bhimtal lake is named after Bhima, one of the Pandava Brothers, from the Indian epic poem the Mahabharata. "The dam is 500 feet long, with the convex stream upstream. It is 48.5 feet high in the centre, ten feet wide at the top, and 36 feet wide at the base, and is strengthened by curtain walls at the main outlet." Near the dam is an old temple built by Baz Bahadhur Chand, Raja of Kumaon, in the 17th century.